YIMBY Festival 2014 was a huge success! More than 70 organizations from across Toronto gathered in the gymnasiums at University of Toronto Schools to celebrate a culture of “yes” in our city and share ideas for improving the work of city builders, non-profits, grassroots organizations, and collaborative consumption innovators. There were so many great parts of the day – from the informative panel discussion and flash presentations about community development and collaborative consumption happening in the auditorium, to the chatter and excitement of people throughout the hallways and gymnasiums. It truly felt like an “ecology of local democracy” emerged at UTS for the day, as people came together with the common goal of improving the way our city functions at the local level, and saying “yes” to everything that makes it better. – When Annabel Vaughan spoke with Anne Gloger from the East Scarborough Storefront and Victor Willis from Parkdale Activity Recreation Centre (PARC) about the changing climate of community development organizations and the expectations to produce consistent new projects. – Lucy Gao’s insightful panel discussion with Ryan Dyment of the Toronto Tool Library, Bailey Greenspon of Share Thanksgiving, and Adil Dhalla of CSI about how Collaborative Consumption projects get started. – During the Flash Presentations when Repair Cafe outlined the goings-on at an average night at a repair cafe, including the importance of making it accessible to all age groups. Many thanks go out to all of the wonderful organizations and people who attended and helped make the day such a success, as well as the CCE volunteers, staff at UTS, and students from the Maximum City program who put on a great kids table that was just as fun for adults! 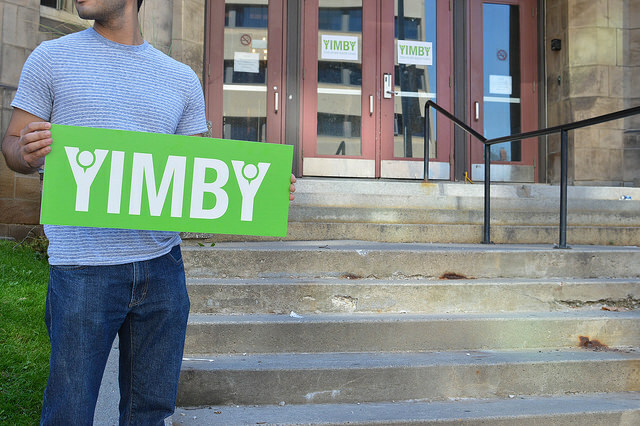 We are so pleased that YIMBY 2014 was such a hit! Looking forward to YIMBY 2015! ← 10 No Brainers to Make Toronto More Awesome!